In Flat Mites of the World Edition 2, you will find interactive keys, fact sheets, descriptions, and images to aid in the identification of flat mites (Acari: Trombidiformes: Tetranychoidea: Tenuipalpidae) from the United States and around the world. Please note that this tool is a work in progress! The newest edition of the tool, updated as of May 2013, will help identify the 38 genera of flat mites present throughout the world, including specific diagnostics for 20 species of Raoiella, 19 species of Brevipalpus, 3 species of Cenopalpus, Dolichotetranychus floridanus, Tenuipalpus pacificus, T. crassulus, and a closely related new species T. nr crassulus. The genus Raoiella is of major concern to quarantine world-wide due to the rapid spread of one species, the red palm mite (RPM), R. indica Hirst. The genus Brevipalpus is the most commonly intercepted genus of Tenuipalpidae in quarantine world-wide, but it is also the most complicated and by far the most diverse genus in the family. The three most important species in the family world-wide, Brevipalpus californicus, B. obovatus and B. phoenicis, though still consistently confused and misidentified, can be identified using this tool, and the Brevipalpus phoenicis species complex has been further separated into seven cryptic species. 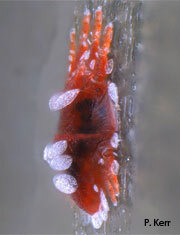 Dolichotetranychus is increasingly diverse genus of monocot-associated flat mites. Here we present diagnostics for an economically important species associated with pineapple across the world, D. floridanus. Tenuipalpus is a hugely diverse and complicated genus. Tenuipalpus pacificus is the name most commonly applied, correctly or incorrectly, to species in the genus Tenuipalpus intercepted on orchids across the world. We provide diagnostics for T. pacificus, based on type material. A recent incursion in the USA of an unidentified Tenuipalpus mite near T. crassulus sparked our interest in providing diagnostics for these two flat mite species associated with succulent plants.